I don't really like ever hearing a book called "perfect." A dollop of imperfection is, in my eyes, the mark of a book that's really striving for something new -- and because that "something new" never quite fits exists categories to judge it, "perfect" just never seems quite right. Having said that, I'm also no dogmatic! Sometimes a book defies even my own defiant expectations and preferences, and I'm forced to dig deep for appropriate synonyms. 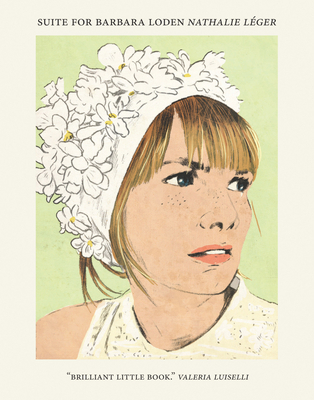 In the case of Natalie Léger's Suite for Barbara Loden, the most appropriate word I've landed upon is exquisite. What's going on in this book is hard to down into a blurb. A mash of imagination and fact, biography and fiction, Léger is as curious about what she is doing as we are. You needn't know much about the cinematic work of Barbara Loden or her cult film, Wanda, the analysis of which is the pivot around which this little books turns. This is because Légerger's singular obsession somehow, and brilliantly, expands into something universal about all the untold things that are lost and gained in teh course of "playing our role" / "playing one's role" in life.